Summary: The power of our ruling elites is usually lightly applied (that’s all that’s necessary for a domesticated people). But it can be seen when looked for, as it surrounds us. In the photos of your daily newspaper, which are often more important than the words. In the evolution of a political movement, as larger forces seek to mold it into more useful channels. Americans get much of their information — and the positioning or context of this information — from the news media. Viral communication via the Internet reaches mostly fellow-believers. Quickly reaching the US mass audience requires their assistance. They can position events as good or bad, depending on how they choose to tell the story. In most cases they will spin the narrative to the needs of our ruling elites — or one faction of them. This is the naked face of power, albeit non-violent, in a modern western society. 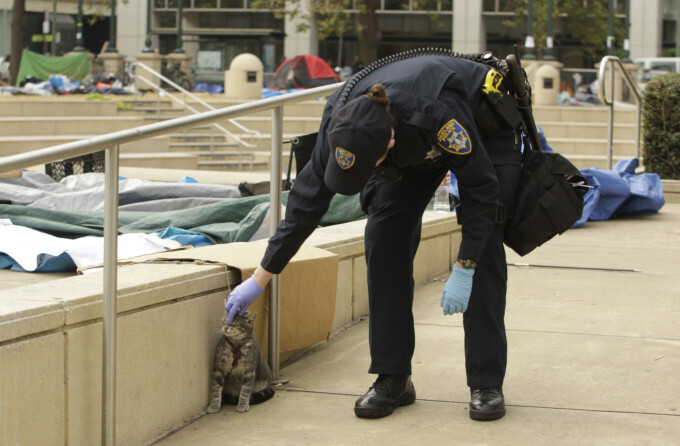 This cute photo — with its friendly policeman — accompanies an article about the Occupy Oakland protests (see the page here). For more accurate pictures see Washington’s Blog: Egyptian Brutality Comes to America — “Police Fire Tear Gas, Flashbang Grenades and Rubber Bullets at Peaceful Protesters”. Or see the Occupy Oakland website. Even though the story, written later in the evening, included information about the arrests and tear gas, no news images had moved by our production deadline … The photograph was chosen because it was a visual “moment” in time. Reducing taxes on the rich and cutting the safety net have been long-term goals of the Republican Party’s rich backer for decades. Those were steps to gathering power. As seen in the network of well-funded think-tanks and advocacy groups focused on these issues. Neither were initial concerns of the Tea Party, created to protest the bank bailouts. The application of money and skill molded them to a different purpose, helping elite groups (including the banks). Channeling the TP’s energy into support of their goals — and repudiation of the TP’s initial anti-bank focus — demonstrated a fantastic degree of skill and resources. The Republican primaries provide more evidence of the our ruling elite’s power, in which the candidates compete to best shift taxes from the rich to the middle class (eg, the Cain and Perry tax plans), and to slash the safety net — even to the extent of mocking the unemployed and advocating letting the poor sick get little or no care. These things work against the interests of most Republican voters. What an accomplishment, getting people to vote against their own interests! I wonder if we are yet ready to even start on the long road to reforming America. Street theater and dressing in costumes (or as unicorns) will not defeat the combination of power and skill deployed by our ruling elites. It’s probably a later step, when the movement has already been well-positioned in the public’s mind. Developing a strategy, organizations, funding, recruiting people with the necessary skills — there are many steps that accompany mass mobilization. Even an open-source movement (see John Robb for details) requires these things among its components — plus some form of coordinating mechanism. How does one design an electric motor? Would you attach a bathtub, simply because one was available? Would a bouquet of flowers help? A heap of rocks? No, you would use just those elements necessary to its purpose and make it no larger than needed — and you would incorporate safety factors. Function controls design. The Occupy movement will end up co-opted just like the Tea Party was. Perhaps. Or just ignored, and allowed to burn itself out — or fade into the host of other weirdness in the fringes of American society. Every downsizing and outsourcing, every underemployed college grad, every law firm associate who has been passed over for partnership, or every assistant professor who has been denied tenure, is a potential recruit. I was just reading an article today about how Europe should regroup by casting off the lesser countries. Every citizen of whom would become a potential recruit. While true, this is a classic business fallacy: looking out and seeing that everybody is a potential customer. I means nothing. Absolutely nothing. You might just as well count the stars. Only intense marketing and sales can make political change happen. Good organization, teamwork (people with the relevant knowledge and skills), lots of work — and time. In the real world nothing self-organizes. Getting together and chatting produces nothing. Actually, in the real world, lots of things self-organize – and that’s an empirical fact. But it’s also a straw man so far as my argument is concerned. I said nothing about potential customers. Instead, I said that the very “people with the relevant knowledge and skills” to whom you refer are to be found amongst those who are being downsized, outsourced, and otherwise outcast by the current system. And where else do you think they might come from? As for what getting together an chatting might produce ( another straw man, btw ) I once spent a lot of time at a certain cafe in Florence now famous because Garibaldi and his cohorts once would get together and chat there. I don’t believe we are on the same track, talking past one another. Your comments were in the midst of a thread, and I answered them in that context. Most of these comments assert that large crowds are a sign of effective political change in motion. I disagree, saying that the odds suggest otherwise. Yes, everything must start somewhere — from nothing. So great things might start from a cafe. Or from the resolution of a single person. My point concerned what comes next in most effective reform movements. Organization. We are discussing a very narrow slice of life: political change. Crowds and riots seldom (not never) self-organize, and when they do can become co-opted or mutated into monsters. Gathering crowds and hoping great things self-generate is a gamble; history suggests it seldom pays off — and sometimes has very bad outcomes. My point was not denying that there is a large potential market, or sayig that a large potential market is bad. Merely that it means nothing by itself (this is a standard biz textbook admonition). Much of history consists of oppressed people, who on occasion protest and even riot. It usually comes to nothing. lacking the organizational prerequists for effective political change. I live in Oakland. I was not interested in the Occupation camp before, as a couple visits prompted me to dismiss it as another ineffectual demonstration. That changed when I saw the pictures of the police eviction. I was in the middle of the heavy-handed protest response, with the gassing, flashbangs, and beanbags. I also was present for the massive follow-up protest which retook the Square yesterday. And I was at the meetings to organize for general strike next week. I have never seen such energy in a political gathering, and I visited the Tea Party rallies just to check them out. They pale in comparison. What is happening in Oakland right now is powerful stuff. Thousands of people are mobilizing. I am not sure where it will go, but it is certainly real. Perhaps this is the beginning. Organizing is happening on-the-ground. Normally totally disengaged people are breaching unheard-of topics, having sophisticated discussions about society, economics, policy and action. And it’s all bottom-up, 100% organic. And the core organizers are actually informed, unlike the Tea Party fantasy where tax cuts trickle down and we are winning the war on terror. I understand we are just one city, and we don’t have clear positions yet, but what if we manage to get four, five, or ten thousand people to demonstrate next week. That has to be worth something. (1) The San Francisco Bay area is politically active in a way rare in America. Extrapolations to the rest of the US are dubious. (2) From what I could tell from the photos, the protest was not representative of even Oakland. Mostly white faces. (3) I suggest fear is appropriate when hearing about a protest with “energy” but no clear positions. It’s begging to be co-opted or mutated. Either into the mainstream or into monsters. It’s pawns in motion. No, it’s not. It’s activity without meaning. Mass demonstrations are easy to generate during periods of social stress, and quite common in western history. They almost never amount to much. It’s little more than dancing in the streets, which is IMO a large element of this. Your prejudices are showing. I doubt any detailed analysis would support your belief that the OWS protesters are better informed than those in the TPM. Those are all valid criticisms FM, and I don’t want to turn this into the shouting match that happened when the TP people came through, but I would like to respond. (1) We are aware we are not representative of the nation, and that is precisely why we are pushing forward; hopefully we can set some kind of plausible promise or example for the rest of the nation. At the very least, it is a chance to galvanize our own community and build networks for future organizing should Occupy fizzle. (2) The original protests on Tues (against riot police) was majority young and white leftists, as expected of this type of action. However, following that, multiple times more colored people are coming out in response to the police brutality. Additionally, we have made it a core strategic priority to reach out to community organizations, especially those of representing colored people, in an effort to expand the diversity of Occupy Oakland. We are still in the infancy stages. (3) Collective and physical energy is necessary to mobilize people to come out. Political movements are not build in conference rooms or blog forums. Regarding being co-opted, we are well aware of what happened to the TP, and are doing our best to remain truly organic. Once again, it’s a work in progress; right now we are legitimately independent of elite manipulation, and will attempt to remain so. (4) Thousands of people are easy to mobilize? Really? I’ll believe this when I see the FM mass rally. Last time I checked, community and political organizations of all kind have been speaking of a drop in mobilization for years. Additionally, right now we are dancing in the streets to gather numbers and attention, but there are committees and proposals in the works for developing a more concrete mission statement and policy direction. (5) Of course I’m biased; I’m part of the movement. However, the TP was overrun with people declaring paranoia about tax rates, gun control, the UN, our “successful” wars, and birther nonesense. You have documented this yourself. Occupy, in contrast, has focused mostly on the reality of the disproportionate economic and political power of the ruling elites; this in-and-of itself shows a greater awareness of the situation and the outright absurdity of the TP. We may not all be geniuses or news buffs, but at least we’re not spouting outright fabrications. Yours are all good and valid points. We can only speculate about the future course of these events. Yes. The easy form are called riots, and are a commonplace event in western history during times of social stress. They are astonishingly easy to start for people well-connected in a community under severe stress. And they are even more difficult to channel. I’ll not provide proof by demonstration, aka social arson. Here’s a shot of Oakland Police recruiting new members for the “occupy” movement. There were some rumors that a group of serving USMC in uniform were going to attend, to see if the Oakland cops would try beating someone who wasn’t a woman half their size. If that story is true, some Marines are kidding themselves. Police in the US have a long history of breaking up riots by large gang members in the inner cities, strikes by Teamsters and miners, and other tough guys. They are pros; it is a core competence. It doesn’t have to be like that. There are other ways. Quite so. Nothing is written. But nevertheless, owners of casinos and racetracks live nicely betting on the odds. Getting yourself killed (or at the very least brutalized) in a foolish enterprise that cannot possibly work isn’t all that bad a plan if you want to start a revolution. It’s probably failed a bunch of times I don’t know about, but it’s a decent enough tactic nonetheless. As far as I understand it, the Tea Party got taken over because lobbyists were able to insert themselves in the movement as organizers, and constantly fed stories to the media dictating the narrative that the Tea Party represented. Though I’d question how much co-opting was needed when the movement was started by a derivatives trader ranting on CNBC. If design follows function, (and I’d seriously question Heinlien’s skills as a social engineer), then the anarchic leaderless, demand-less model of OWS is probably smarter design than it’s given credit for, as it’s a decent way of ensuring that the same tricks won’t work if attempted against OWS. A big part of the reason I’m optimistic about OWS is because they’re stepping into an environment where it’s clear that just about every institution has failed. It’s one thing to protest against the system in 1960, when it’s delivering the highest standard of living on earth. It’s quite another when wages have been stagnant for 30 years, your kids will be worse off than you are, and no-one in power seems to have a clue what they’re doing. As you’ve said, the elite do know what they’re doing, but their need to dissemble has created that impression. I also think that OWS is well placed for the second step of an insurgency, dividing into us and them. High level organization only needs to happen after that, when the various sides start contesting specific issues and policies. I do not see that much of the analysis by members or fans of OWS is superior to that of the the TP. It is too early to say, but the reverse might be true. The great similarity of both is their (IMO unwarranted) feeling of superiority to one another. Absurd. This is a long, deep recession. Nothing unusual in US history, and common in world history. Visit Somalia to see a society where many (not all) institutions have failed. Silly. One of the simple absurdities which will probably render OWS as unsuccessful as the TP in accomplishing their objectives (if they get objectives, that is). They know quite well what they are doing. For example, the 2008-2009 period was similar to 1929-1930, but skillful economic management avoided a depression. More broadly, most of what they are doing is successful, in terms of the elites for whom they work. — Alexis de Tocqueville, Democracy In America,, 2nd. ed., 1840. FM note: Thanks for this! Notes from the past are always welcome here. Those from Alexis d T are always useful! FM, I have to disagree again with your characterization of the Tea Party and the Republicans. The Tea Party was set up by Republican agents to be like the “Swift Boat” movement that so effectively torpedoed John Kerry. The website had already been set up and the signs for the Tea Party had already been purchased before the movement started. Compare the first few video images of the Tea Party in 2008 with the OWS in 2011 and you’ll see that the Tea Party has nice signs while the OWS uses crayons and ripped up cardboard boxes. Now onto the mainstream Republicans. Yes, they’ve talked about cutting the social safety net and shrinking government for decades. But, if you look at the size of government and government benefits over the last 30 years, you’ll see that they expand faster under Republican presidents than they do under Democratic presidents. Yes, the Republicans shower the public with tax cuts but they also give them expanded Medicare coverage, vastly enhanced military retirement benefits, and massive amounts of corporate welfare (see KBR). This has all been paid for by massive increases in deficit spending. It has only been since Obama won the White House and the Tea Party REALLY turned up the heat on the mainstream Republicans that they’ve actually been serious about cutting government services. The rank and file of the Tea Party is only concerned with cutting the size of government and for the most part, they don’t care who (besides themselves) gets hurt. A lot of them are even willing to vote against their own immediate interests (healthcare and unemployment) if they see their larger long-term goals (shrinking the size of government) being met. Most of these people have a strong religious faith and tend to see the world from a faith-based viewpoint that can be co-opted to other purposes if the other purpose can be linked in their minds to their primary goal. My original expectation (and I believe that of the Republicans) was that the Tea Party would attack the Democrats in 2008 but instead it attacked the Republicans as traitors to the cause of smaller government (a well-deserved backlash against the excesses of the George W. Bush years) and Obama won big. In 2010 the Republicans partly co-opted the Tea Party but mostly, they joined them and it was a good election cycle for both groups. Now the two are splitting apart again because the Tea Party does not feel that the mainstream Republicans have a pure enough faith in the cause of shrinking government (Boehner has tried to compromise with Obama several times) and because they don’t like Karl Rove and his Crossroads network. Here’s an article supporting this: “Dark Money Showdown: Kochs vs. American Crossroads“, Andy Kroll, Mother Jones, 10 October 2011. I am unclear with what you disagree. Most of what you say has been said on the FM website, as usual in considerable detail. See the links below about the Tea Party, where I made similiar points. That was then; this is now. The Republican Party has changed while the outward form remains the same. Like Invasion of the Body Snatchers (1956), with rich conservatives instead of aliens. You might as well say that the Republicans are the friends of minorities because of their role ending slavery. Political movements evolve over time, sometimes radically. That was the point of this series, which dramatically illustrates this point. In the end all that matters is where they started and what they’ve become. They are useful shock troops, serving the interests of a long-term project by conservatives to move this nation far to the right. The puppet masters do not care about the puppets’ dreams, just that they respond when the strings are pulled. “instead it attacked the Republicans as traitors to the cause of smaller government (a well-deserved backlash against the excesses of the George W. Bush years) and Obama won big. In 2010 the Republicans partly co-opted the Tea Party but mostly, they joined them and it was a good election cycle for both groups. Your are missing the point. The Tea Party are shock troops, wielded as needed to advance the interests of those who’ve captured them. Sometimes they attack Republicans, sometimes Democrats. (libertarian-anarchist warning) Some analysis of the “message incoherence” of the Occupy ___ movement by a local poliical activist in Okaland: “The Occupiers and the State“, Anthony Gregory (bio here), Lew Rockwell, 28 October 2011. Suggestions about how protestors on the left and right might find common ground with each other and libertarians against the evils of state capitalism by the same author: “Occupy Wall Street: A Story without Heroes“, Ludwig von Mises, 4 October 2011. An important note to everybody about posting links! If you go through the work of posting links in comments, include a citation: title, author, source, date! Otherwise you are wasting your time. The WordPress stats show me what links people click on. Links’s without citations get few hits. I mean nearly zero hits. People want to know more about the article before bothering to look at it. Which is reasonable! The crisis of contemporary modernity (what remains unfinished about modernity as a project) is that the systems media (A & G) have become de-coupled from the lifeworld and its media (I & L). The “societal community” of I & L are increasingly colonized, in the sense that members of the community have less sphere for communicative action. Their relationships are increasingly mediated, locally, by money and power. McDonalds is one example; the contemporary university is another. In the university, department meetings could, ideally, be a place where communicative action takes place and influence and value-commitments are regenerated. We could, in those meetings, attempt to reach common understandings. In one meeting we were discussing a proposed change to the curriculum. I was trying to ask a colleague why s/he wanted this change; my “communicative action” involved asking what s/he was trying to teach, how that teaching was going, and so forth. The colleague’s response was: “If you don’t like the change, vote against it.” In other words, s/he didn’t want to talk, explain, or reach a common understanding. Instead we would each gather votes and whoever had the most votes would win. Systems media (power, votes) had pushed out lifeworld media (appeals to common value commitments as a basis of influencing colleagues to believe one option or the other best represented who we want to be, as a departmental community). It’s important to understand that this colleague acted in a milieu that the university as a system creates: money and power dominate, and local understands don’t count for much. The colleague was part of this colonization process, but s/he was only reflecting a larger process. Background: Here. Linked from here. Free enterprise economic systems evolved in the modern period as culturally transmitted values related to honesty, hard work, and education achievement emerged. One evolutionary puzzle is why most economies for the past 5,000 years have had a limited role for free enterprise given the spectacular success of modern free economies. Another is why if humans became biologically modern 50,000 years ago did it take until 11,000 years ago for agriculture, the economic foundation of states, to begin. Why didn’t free enterprise evolve long ago and far away? … Most of the time both cultural and genetic evolution seem to noodle about aimlessly in response to local events and forces either only very gradually moving in any particular direction or to make sudden, rare excursions (both patterns appear in the fossil record, (Carroll 1997)). … We will argue that the social instincts that we inherit from our tribal past were shaped by gene-culture coevolution in which group selection on cultural variation played the leading role. This process seems to have been especially active between about 250,000 years ago and 50,000 years ago (McBrearty and Brooks 2000). The macroevolutionary puzzle is thus why, given the current adaptive success of free enterprise societies and the fact that humans were apparently completely capable 50,000 years ago, did cultural evolution proceed so slowly over the past 50 millennia? … Challenging the emphasis of selfish rationality in conventional economic theory is the main theme of this book. Neither the neo-classical assumption of selfishness nor the assumption of rationality is an innocent simplification. … Human social behavior differs from that of other primates (Brosnan this volume); a natural hypothesis is that the evolution of human sympathy was driven by increasing oxytosin production in response to empathetic acts of others and to our own empathetic acts. But like domestic animals, we retain a healthy interest in our own comfort and opportunities to reproduce. We call this the tribal social instincts hypothesis in honor of Darwin’s original formulation. Thus, we are imperfect and often reluctant, but often very effective, cooperators. We are contingent cooperators. Few will continue cooperating when others do not. The effectiveness of our cooperation is not just a product of our social psychology; rather, our social psychology creates evolutionary forces that build cultural systems of morality and convention that in turn make possible sophisticated systems of cooperation such as businesses. Individuals are not really that rational. We depend upon cultural evolution to generate values and social institutions over many generations that are more groupfunctional than individuals can hope to devise based directly on our social instincts. … Tribes worked only for their members benefit, whereas businesses and other organizations within complex societies have a broad array of “stakeholders” to satisfy— customers, suppliers, owners, lenders, neighbors, and regulators. The great vice of tribes was inter-tribal anarchy. The small compass of tribal patriotism frequently led, particularly when population densities increased after the evolution of agricultural subsistence, to chronic military insecurity. Complex societies use grants of power and other devices as “workarounds” to control inter-“tribal” anarchy in the interests of domestic tranquility and an efficient division of labor. A collection of tribes that owed obedience to paramount chief who settled disputes among them could thus mitigate intertribal anarchy. A professional priestly establishment might invent dogma and design rituals by which a tribe might maintain a sense of common culture and social solidarity as it grew far larger than the egalitarian tribe of the ancestral hunters and gatherers. But such workarounds often lead to management problems, such as abuses of power for selfish ends (Richerson and Boyd 1999). Successful management is thus substantially the art of using work-arounds to tap the tribal social instincts while at the same time minimizing their inherent vices. … Some business management scholars believe that the influence of neo-classical economists with their rational-selfish models and intuitions has crowded out the moral hidden hand in the behavior of management school graduates (Ferraro et al. 2005, Ghoshal 2005). … Most economists are surprised by findings, such as Orlitzky et al.’s (as they are by many of the cultural-evolutionary findings that underpin our analysis). Economists have been trained to expect a tradeoff to exist between a firm’s profitability and any special attention it pays to social or environmental concerns rather than the synergy between these goals predicted by cultural evolution (and supported by laboratory experiments). Economics students, incidentally, are quite resistant to the moral hidden hand in the laboratory than other students and have trouble making cooperation work (Marwell and Ames 1981)! Having imbibed the selfish rational assumption, they are handicapped in running the model businesses we set up in the laboratory. WTF — I believe that your time and effort will be more fruitful if you do these differently. You will see that the usual practice here — and on most websites — for material like this is to explain why people should read this — a brief statement of why this is of interest and relevant to the thread, along with a citation and abstract (a summary or brief except). This is 775 words long; longer than most posts. it might be useful, but that is not obvious to the casual reader. And few (perhaps nobody) will read it on the chance that it might be interesting. Think of comments as casual conversations, and long blocks of text as a lecture dropped into the middle of the discussion. Dragging the conversation off track here; I’m seconding FM’s position. I have a life, kids, work, etc to attend to and have to triage my time aggressively. Long block-dumps are ignored in favour of executive summary and a link for more. Make a position, demonstrate you have references to back it up and I’m reading your post at least. Opportunity is wasted with volume instead of density. On topicish: This and the ‘arab spring’ movements are heavily reliant on social media/sms to provide a more…egalitarian?…mode of communication. I wonder if there is an opportunity for the traditional communication (mass media) structures to be unseated and how likely it is to happen before social media is assimilated into ‘The Message’, which must happen; rivals cannot be allowed to thrive. My other observation is that all of this is high-tech and utterly dependent on a small cadre of corporations (communications ones have a stake in The Message and disseminating it). If a celebrated open-source revolution is predicated on the technologies and services provided by closed (iron fisted and ruthless in service to their shareholders) businesses, does that not leave it incredibly vulnerable? I should leave it there or I run the risk of a long and ignorable post by my own standard. “Challenging the emphasis of selfish rationality in conventional economic theory is the main theme of this book. Neither the neo-classical assumption of selfishness nor the assumption of rationality is an innocent simplification. Successful management is thus substantially the art of using work-arounds to tap the tribal social instincts while at the same time minimizing their inherent vices. Richerson and Boyd repeatedly use the work “noodling” to describe how unstable the processes of social problem solving are across all societies and civilizations for 8,000+ years. When “scaled up”, the problem solving methods in the tribal forms of culture created by human evolution become unreliable. When culture becomes lacking in compassion, cooperation and sympathy, expect big trouble to set in. There seems to be a horribly misplaced human tendency to seek out clarity and absolutisms in the face of the natural crappiness and uncertainty of social problem solving capabilities that evolution has handed to us as human beings in complex, large societies. If one was attempting to speculate about how protests play a role in social problem solving, the information could be pertinent: evolution has given us poor tools to solve social problems. So, problems (even if well understood by the intellectual elites!) will either not be solved in actual practice, or the solutions actually implemented will usually be less than great ones. There are several extremely tantalizing items in the excerpts I provided. If people do not have the time or interest to even contemplate those, then there is little hope that they would read the entire (25 page?) document, which is scientifically dense (to people unfamiliar with anthropology). Female archetype – love, acceptance, “nurturing mommy”. It is only in postmodern culture that the absolutisms of the archetype of modernism: Rationalism and Industry, begin to weaken under the demands of pluralism and inclusion. Unfortunately, postmodernism has its own pathologies and absolutes: narcissism and nihilism. THIS IS WHAT IS REALLY AT PLAY IN THE PROTESTS: TWO PATHOLOGIES COMPETING FOR ATTENTION. TWO SICK VERSIONS OF AMERICA DEMANDING RECOGNITION AND VALIDATION EVEN AS THEY BOTH CONTINUE TO GENERATE MORE WIDESPREAD DYSFUNCTION. ALMOST NO ONE IS TALKING ABOUT A THIRD WAY. STILL…. For anyone that is serious about social change theories and how they apply to protest movements and debates about economics and politics, the material is well worth reading. Richerson and Boyd’s work on the (scientific) evolution of social institutions was recently cited by Geoffrey West (physics), head of the Santa Fe Institute, in his work on scaling theory and global economics. The matereial is dense, but I did actually read most of the document in depth. The long list of interesting possible reasons for the slow pace of cultural evolution near to the end of the article remain to be read. Most analysis of captalism (and its problems) is devoid of reference to scientific perspectives arising from evolutionary theory and supporting EVIDENCE/FACTS. The Richerson-Boyd document provides extraordinary insight into the deeper levels of human culture and psychology that lie behind the debates over economic and political organization, religion, paradigm shifts, conciousness studies, individual identity and group identity, war and peace, etc. All of the grand theories, religions and philosophies of the past 10,000 years of human “civilization” are reduced to their essences. Science can be a disinfectant, cleansing the rot of bad ideas. In this case, evolutionary theory relativizes the truths contained in the grand theories of traditional/classical thought. Popular proposals that either economic “self interest” or utopianism/altruism (on the other hand) can be elevated to the status of absolutes (to justify ideological/political agendas) are shown to lack validity. I have attempted to be reasonable, but to no avail. Repeated warnings and moderation have done nothing. Please get your own blog to write such long articles. Comments should be directly related to the thread and brief. Future long comments like this will be truncated at 150 words, per the Comment Policy. Everything after that will be deleted. When WordPress eventually provides a “more” button then you can go on at any length. The EU is clearly a mess because of the consequences of postmodern culture: widespread social behavior based on indulgence and irresponsibility (lack of order and male archetypes). The left will not be able to solve any problems because the left created the problems. The right will not be able to solve problems because it has been appropriated by vile exploiters. Both “sides” elevate their partial truths to full truths, and demand that people adhere to the resulting absolutisms which in reality can only lead to dysfunction. To advance, the EU must transcend leftism and postmodernism by embracing holism/integralism. What will last is that the archetypes underlying the industrial revolution, such as scientific rationalism, will be displaced by the archetypes of the information age. Bernie Neville of Latrobe.edu has written that from the viewpoint of four different perspectives within conscioussness studies (Jungian psychology, etc. ), the god of the information age is Hermes: the god of deception and slipperiness. Feel good stuff is more important than rational order (Apollo) or hard work (Promethius). Incredible concentrations of wealth result from modern information technology, and social justice and increased equality are ignored except as part of a “feel good” politics that stresses “style over substance”. Presumably part of what perplexes some people about the protest movement is its celebration of style over substance. One could speculate that the internet corporations have simply not yet figured out how to create a “cool” form of technoconformism that is capable of absorbing the “occupy” protests. A $35 Android tablet is coming fro India. Maybe as long as all the poor people in american can afford a tablet, they will be happy to sit in the ghetto and be quiet and be online?